The Four County Career Center FFA chapter in Archbold recently attended the 91st National FFA Convention in Indianapolis, Ind. 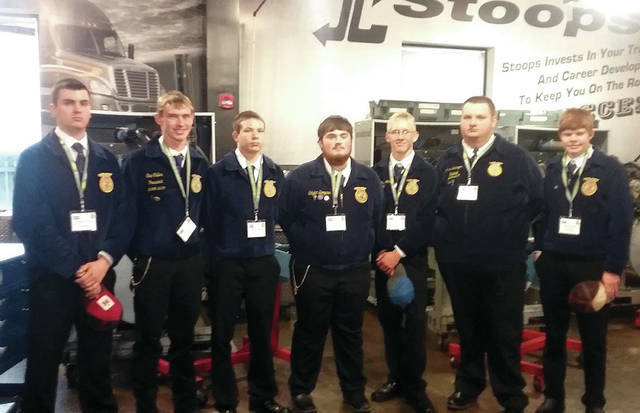 During the convention, FFA attendees attended several leadership and team building workshops, general sessions with motivational speakers, toured Lincoln Tech, visited the John Deere 75th anniversary display, and saw various entertainment groups. There were over 67,000 guests and FFA members present at the convention. Those attending from FCCC included – from left – Haydon Guyer of Liberty Center, Eric Culler of Fairview, Kameron Maurer of Napoleon, Skyler Bergman of Edon, Josh Brushaber of Patrick Henry, Jared Leininger of Evergreen, and Keaton Stark of Bryan Jason Elston, Ag/Diesel mechanics instructor, and Stephanie Pippin, veterinarian assistant instructor, accompanied the students. https://www.fcnews.org/wp-content/uploads/sites/45/2018/11/web1_2018-national-ffa.jpgThe Four County Career Center FFA chapter in Archbold recently attended the 91st National FFA Convention in Indianapolis, Ind. During the convention, FFA attendees attended several leadership and team building workshops, general sessions with motivational speakers, toured Lincoln Tech, visited the John Deere 75th anniversary display, and saw various entertainment groups. There were over 67,000 guests and FFA members present at the convention. Those attending from FCCC included – from left – Haydon Guyer of Liberty Center, Eric Culler of Fairview, Kameron Maurer of Napoleon, Skyler Bergman of Edon, Josh Brushaber of Patrick Henry, Jared Leininger of Evergreen, and Keaton Stark of Bryan Jason Elston, Ag/Diesel mechanics instructor, and Stephanie Pippin, veterinarian assistant instructor, accompanied the students.